Information reaching our desk indicates that, newly crowned Face of Asogli 2014, Ms. Dzifa Nukulenuhas been involved in a near fatal accident Sunday morning. The accident is said to occur when the pick-up she was travelling in with her family crashed into a stationary KIA truck between Sanga and Asikuma junction on the Ho-Accra highway. Dzifa’s father who was reportedly driving the vehicle is said to have died on the spot while the beauty queen and her auntie are said to be in critical conditions at Peki government Hospital. 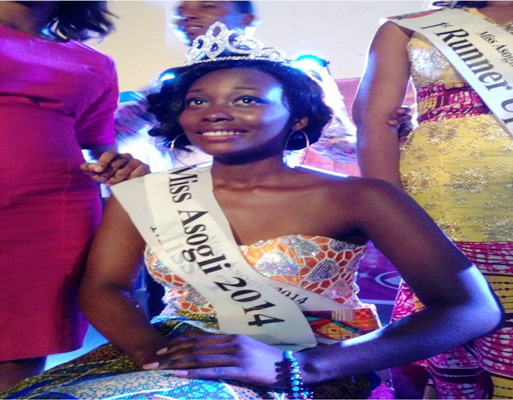 Miss Dzifa Nukulenu, a Level 200 political science student of the University of Ghana, won the “Face of Asogli 2014” beauty pageant last weekend. Dzifa and her family are said to be returning home to Peki after a dinner dance to climax this year’s Asogli Yam Festival in Ho on Saturday night when the accident occurred.